DZZ Double Gold ETN is a relatively new way to take advantage of gold price action. This gold fund provides double the movement that the GLD ETF or the price of gold does, providing bigger opportunities in the gold sector. I have just recently started to use DZZ ETN for trading and have found it to be very useful, which you will see in the charts below. The fact that it's a leveraged fund provides more of an opportunity to the small investor, as they can have twice the amount of gold exposure without having to use margin, pay interest, and open a margin account. While trading with leverage is a two sided knife, if done properly, potential higher annual profits can be obtained. Another reason gold ETN's are becoming popular is because they allow gold traders and investors to trade both sides of the gold sector within their 401k, IRA and for Canadian their RRSP accounts. Being able to take advantage of the short side during bear market conditions, can double your annual return on investment. Now let's look at our current charts and see how this fund can be used. 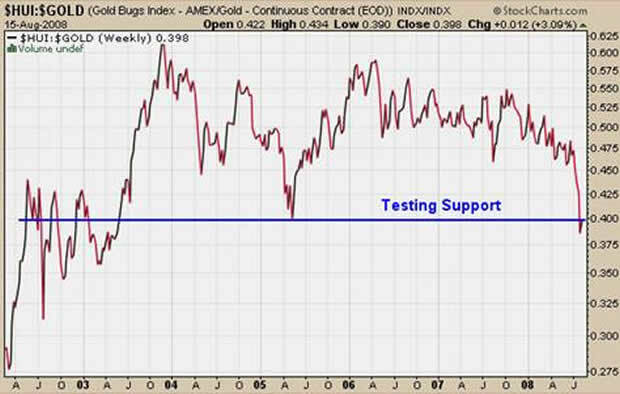 As you can see on the monthly chart, the gold bugs index is breaking down below our support trend line. We could be entering a much larger consolidation phase or maybe even a bear market. 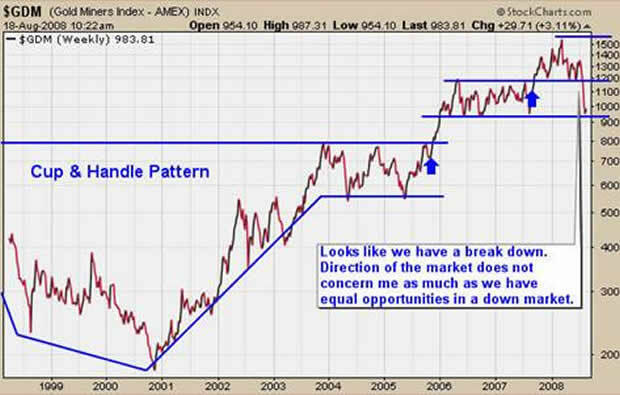 It really does not matter, as we can take advantage of both sides of gold (long and short). The short side actually has more potential in my opinion, but most traders prefer to trade the long side as it's what everyone learns first and feels comfortable with. The gold miner stocks index has given us a breakdown, as well as showing that a short play is not fighting the current short term trend of gold. It is now testing support, which means short traders should tighten their stops to lock in more profits when gold decides to bounce. 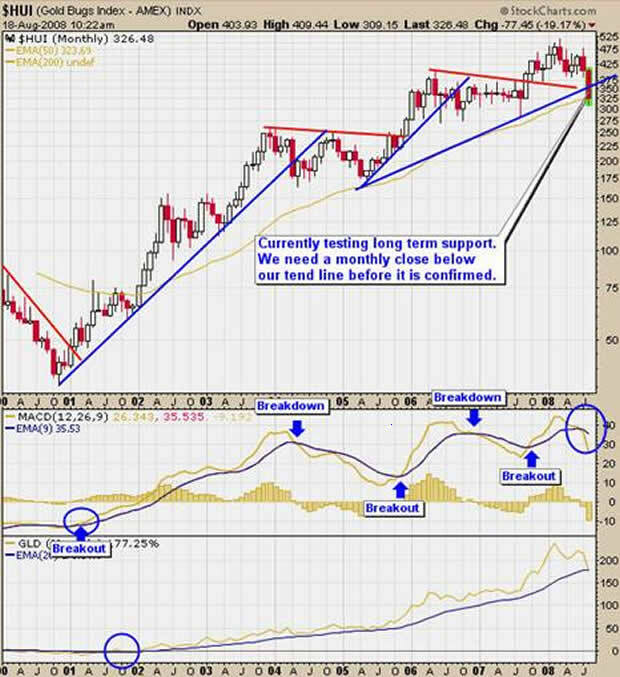 Gold stocks are testing a support level, as they have declined in value against the price of gold, showing that a large number of investors have been scared out of their positions and thus forcing gold stocks down more than normal. 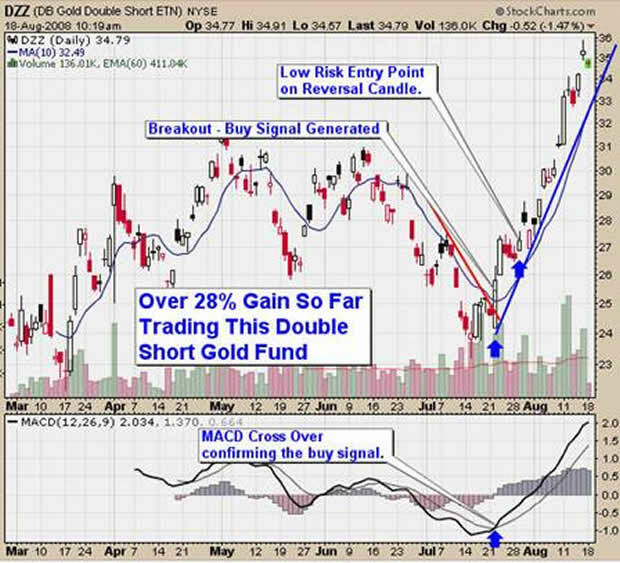 Recently we had a buy signal for the DZZ gold ETN, which has provided an excellent low risk setup near the end of July. Currently the trade is up over 28% in just 3 weeks. While we look for the same type of setup for going short, there is one important point to note. When trading GLD or any other stock, index or futures contract to the long side it's important not to enter a setup with a steep vertical support trend line, as it generally will not continue for any length of time. But trading to the short side like this DZZ trade, the trend lines can be steeper, as prices generally drop much faster, thus pushing our Short Gold ETN fund higher.